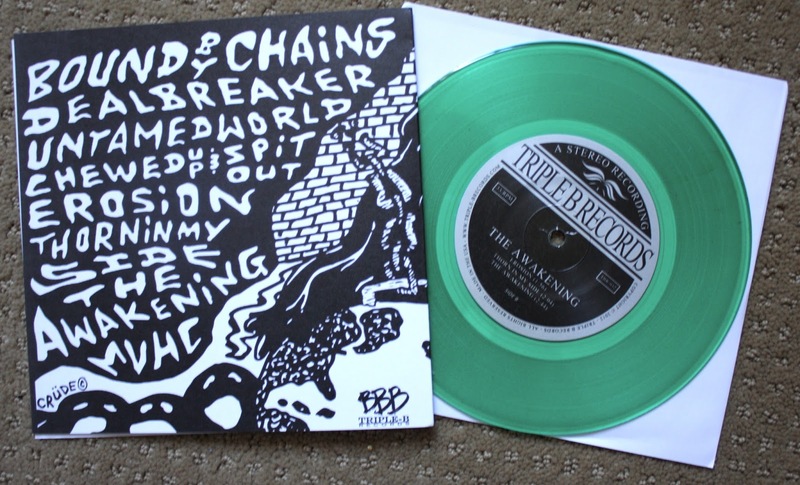 Here is the 2nd press of Rude Awakening's "The Awakening" on Triple B Records. This is the rarest color on clear green out of /100. I have never been really crazy about Rude Awakening's recordings, but I saw them live a while back and I was really impressed. I've been trying to listen to them more but it's taking a while to grow on me I suppose. 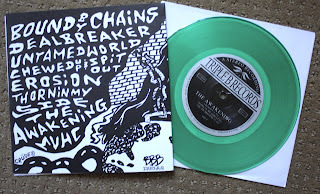 If you like Rude Awakening I would go pre order their new split with Death Threat that went up for pre order yesterday. So ten days into the month and I am still at only 2 posts so far. The past month or so has been crazy, but I really need to step my game up. I've been waiting patiently for a bunch of pre orders to show up so hopefully once those roll through I will be rejuvenated and feel like taking more pictures and doing more posts. Record blogging is a cold game, yo. 'the awakening' took more listens than usual to grow on me. i actually gave it the last chance before filing it away forever. but it clicked eventually. 2nd press cover looks way cooler than 1st press! I hate the art for the first and the second press...... SO Cheesy!